The Department of Intramural and Recreational Sports’ goal is to improve the quality of life and sense of belonging for all members of the University of Louisville community. Through participation in a variety of sports and fitness activities, participants achieve an improved level of physical, emotional, and social well being within a welcoming environment. The Department of Intramural and Recreational Sports serves to improve the quality of student lives using sports and fitness activities to achieve that goal. Intramural and Recreational Sports encourages students to get involved in some activity that will enable them to develop a healthy lifestyle. 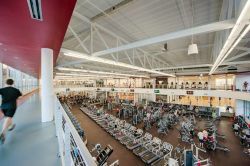 Students can choose from a wide variety of activities ranging from fitness classes to competitive Intramural Sports to Sport Clubs. Our motto is “A Sport for Everyone and Everyone in a Sport."